I know I’ve said it before but we are so lucky to live by the sea and so near to great fishmongers and fishermen. The father in law’s boat will go in the water next week and from that point onwards there will be a glut of line caught mackerel and ling to cook with. If the hubby uses his noggin, he’ll swap the catch for lobsters after a days’ fishing. It’s not that my family are fishermen, far from it, it’s just that we live so close to a fantastic amenity it seems a shame not to use it. Fishing I think is the ultimate foraging activity. It is so abundant if you live close to the sea and providing you only catch what you eat then you can live very well on it. There is however one type of seafood that we cannot catch and that’s prawns. Prawns are typically trawled and we only fish with rods and small nets to land our catch. They are very expensive, but if you prepare them well they are heavenly for lunch, a simple starter or even a large meal. Fresh garlic prawns simply cooked are one of my hubby’s favourite meals but as they’re so expensive they are saved for special occasions. This is what I made him yesterday for his tea and it serves 4 people. If your prawns have not already been peeled and cleaned then do this first. Your fishmonger will do this for you if you ask them. If you have bought frozen prawns then defrost them before making the garlic prawns. Heat your dry frying pan on a medium heat. Peel and slice finely the 4 cloves of garlic. Place the sunflower oil in the frying pan first, then add the butter into the oil. This will prevent your butter from burning. Next add the sliced garlic to the pan. Sauté (gently fry) the garlic, keep it moving and make sure it doesn’t turn brown. If you don’t your garlic will taste bitter. Once the garlic starts to turn a little golden add the prawns to the pan. Turn the heat up high and cook for 4 minutes at a high heat. Squeeze the juice of half a lemon over the prawns and cook for another 2 minutes. At this point the prawns should stop looking translucent and should be beginning to get firm and have a white/pink colour. Remove the prawns from the frying pan and serve. 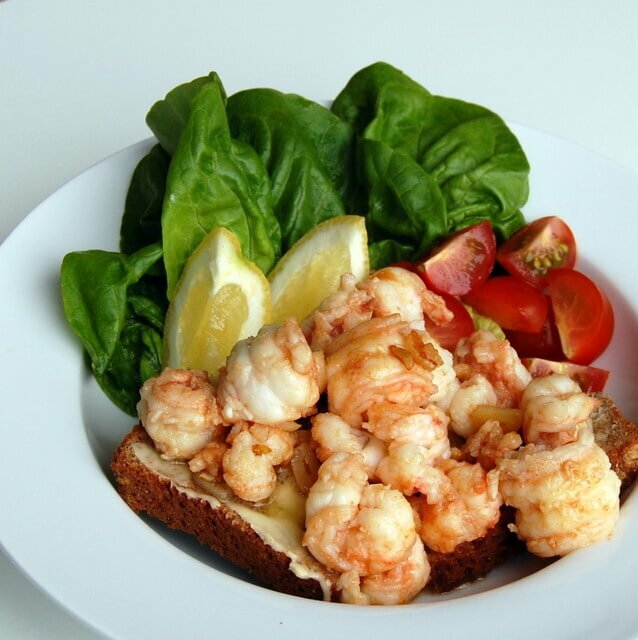 I serve these garlic prawns on a thick slice of Irish brown soda bread with a side salad. If serving as a starter you could serve these garlic prawns on some lettuce leaves to use as plates and save on the washing up. They look fabulous. Prawns are my favourite seafood. Love the presentation too. Thanks Georgina! I didn’t get to taste much of them to be honest! They look so yummy and simple enough that even I can’t muck it up. I’m going to give these a try at the weekend. Do give them a try they are very simple to make & if your fishmonger shells them for you they are very quick to make too! That looks and sounds delicious! (yoi always take great pics!) I’m always really nervous of sea food. Have you any tips so I’d be definitely sure they’re cooked thoroughly? I suppose it just just takes practice. They cook so quickly Lisa it’s hard not to overcook them rather than undercook them. When undercooked they will have a grey appearance (which is basically raw), when cooked through they will have a white appearance. If cooked perfectly prawns should be very soft in texture believe it or not!